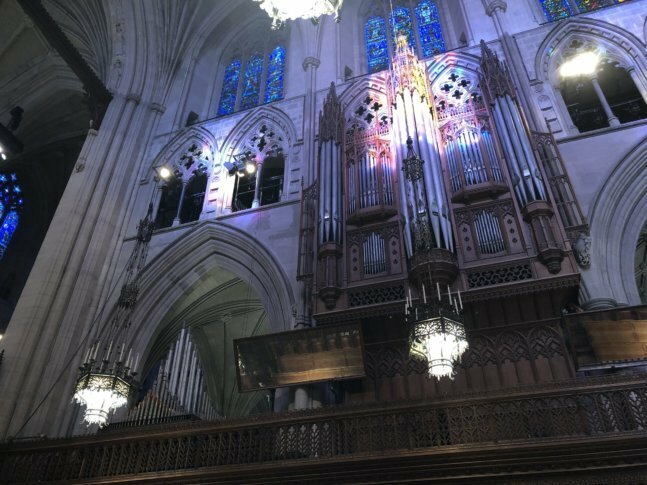 WASHINGTON — A look behind the scenes at the Washington National Cathedral on Monday revealed the intricacies of preparing to host a televised state funeral, in this case for former President George H.W. Bush. Round-the-clock work began at 1 p.m. Sunday. By midday Monday, part of the preparations included a worker suspended off the ground hanging spotlights on massive columns. Aisles were cluttered with stacked boxes of microphones, metal tripods, TV monitors and coil after coil of wires. Outside, some workers continued unloading trucks of equipment, while others connected cables nearly as thick as gas pump hoses to production trucks. Amid the clutter and bustle of activity, church leaders talked with members of the media. “We were created to do two things: to be a house of prayer for all people, and to be a great church for national purposes,” said the Very Rev. Randolph Marshall Hollerith, dean of Washington National Cathedral. Hollerith noted that the cathedral maintains a “funny balance” in America, where there’s an official separation between church and state. “We have this wonderful opportunity to be a place where, symbolically, the nation gathers to mourn, or to celebrate, or to mark the passing of significant events. We are honored to play that role,” Hollerith said. The only U.S. president buried in the nation’s capital is Woodrow Wilson, who is interred at the cathedral with his wife, Edith. Hollerith said the cathedral was constructed not only to tell the story of the Christian faith, as all cathedrals do, but also to tell some of the story of America. As visitors enter the front door, statues of past Presidents George Washington and Abraham Lincoln anchor each side of the cathedral. “Their statues — one in bronze and one in limestone — are glorious and let you know right away when you step into the space that you’re going to be learning about Christian faith, but also about what we hold dear and treasure in American history,” Hollerith said. The National Cathedral was built by the Episcopal Church, but welcomes everyone, regardless of how or whether they celebrate faith. “I think one of the important things about the cathedral is that we’re a house of prayer for all people,” said the Rev. Canon Jan Naylor Cope, provost of Washington National Cathedral. Cope said Wednesday’s service will focus on Bush and on something larger than ourselves. “For people of different faith traditions or of no faith tradition, it’s known by different names. But, as a Christian, I would say that (that larger something is) our earthly death is not the end,” Cope said.